As environmentally friendly alternatives become popular and more manageable for the average consumer, more and more people are turning to green burials. In a green burial, individuals eschew formal burial items like heavy metal caskets and vault liners in favor of simple shrouds or plywood caskets. They might also opt not to have funeral flowers at the ceremony, or even do a webcast of the memorial service to save on long-distance travel. The term “green burial” is used fairly broadly to describe any funeral with eco-friendly overtones. Some people take it very seriously and avoid everything from embalming to headstones, while others prefer to take simple measures like planting trees as a memorial to the deceased. Green burials also have the advantage of costing less than the average U.S. funeral, which now tops over $10,000. Although exact prices vary depending on the funeral home you choose and your location, here is a guideline you can use to compare the costs of traditional burial versus green burial. Casket: Hardwood or metal caskets typically run between $1,000 and $8,000. Green burial caskets, which can be anything from a simple burial shroud to a simple casket made at home or of lightweight woods, can cost as little as $100. Burial Plot: The plot of land at a cemetery is going to cost the same no matter what—typically around $1,000 at the low end—and you’ll still have to pay for the opening and closing of the grave. However, if you find a cemetery that supports green burial, you can avoid the vault or liner (ranging from $200 to $2,000) as well as a headstone (around $500). In some cases, you might also be able to get a smaller grave for less money, since the casket and liner won’t be as wieldy and take up so much space. Embalming: In a green funeral, you may want to skip the body viewing and bury the body faster, which means you can skip the embalming step. Embalming and other body preparations usually run around $300 to $1,000. 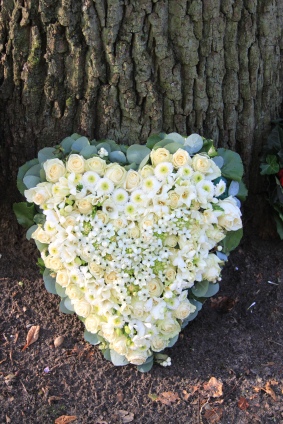 Funeral Flowers: Depending on how elaborate the memorial service you plan is, funeral flowers can cost hundreds or even thousands of dollars. Skipping them in favor of more personalized decorations (or flowers from a garden) can save quite a bit of money. Procession: In a procession from the funeral home to the cemetery, the costs can range from $200 to $1,000. In a green burial, you can save gas and money by simply having the body delivered via hearse and meeting there on your own. There is no exact answer for how much a green burial costs, because the variables will depend on how you choose to approach funeral planning and what kinds of amenities you can’t do without. In most cases, you can expect an overall savings of up to 50 percent—which, at a total price tag of thousands of dollars, can mean quite a bit in the long run.